It is one of the greatest honors when a friend or family member asks you to officiate their wedding ceremony. This may be a first or one of the few experiences conducting this role and your loved ones believe you are the perfect person for the job. From customizing the ceremony, to leading the rehearsal and finally performing the ceremony, there are many details to keep in mind. The task at hand may at first seem a little overwhelming and that is why I am here to help. Since becoming a professional officiant I have had the pleasure of attending many weddings as a guest. 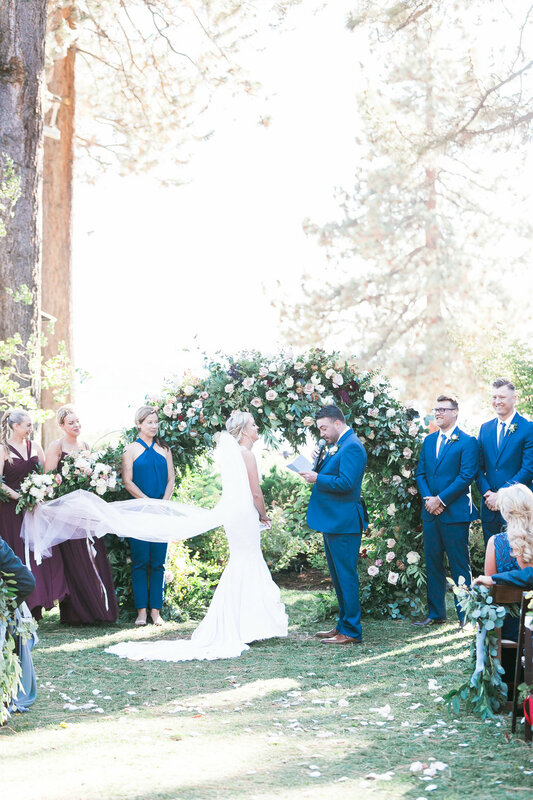 While I’ve observed some folks take on the officiant role as “a one time gig”, I have come away with some tips to share for performing the ceremony. The following tips are items to keep in mind, and are purely just things that I want to mention. I recommend you write down what you feel seems to flow with your style and go over the details in the rehearsal. That will help you remember for the wedding day! I offer complete consultations for officiant coaching, including assistance with writing the ceremony script, guidance for obtaining your ordination and the marriage license, leading the rehearsal and planning the ceremony. Please contact me for further details. Mic; if the ceremony is outside with more than 35 guests, I recommend that you have an amplified ceremony. The best situation is for the officiant to have a lapel mic and then have one hand held mic available. The hand held mic is for the couple to use when they say their vows and if their is a guest offering a reading during the ceremony. Digital and hard copy; I use a tablet to read the ceremony, it works well especially if there is wind and you don’t need to turn pages. I always bring a printed copy in a black folder. Also, ask the couple to send you their vows and you can have a printed version available, just in case they forget to bring their copy. Rings; the morning of the ceremony, know who is responsible for bringing the rings to the ceremony. Then 30 minutes before the ceremony, check with that person that they have the rings for the ceremony. Marriage license; the day of ceremony, receive the marriage license from he couple and keep it with you to sign after the ceremony. This helps prevent anyone needing to hustle around and locate it after the ceremony when everyone is ready to party. Arrive to the alter about 5 minutes before ceremony start time. Your presence at the alter will set the tone that it’s almost go time and the guests will begin to take their seats and button up. As they get settled in, introduce yourself, your name and your connection to the couple. Also mention how fortunate you feel to be the one to officiate the ceremony for the wonderful couple. Unplugged announcement; after your introduction remind guests to turn off their phone ringers. If the couple requests an unplugged ceremony, ask guests to refrain from taking any photos or videos and leave that to the professionals. Bride’s entrance; ask guests to please stand when the bride approaches the aisle. You will then ask for everyone to take their seat once the bride has arrived to the alter and settles in. Giving away the bride; before the ceremony, ask the couple if they want “giving away the bride” to be traditional. This is when the bride is escorted by her father, mother or both and when they arrive at the alter you ask “who gives this woman to marry this man?”. The response is, “I do”, “her mother and I do”, or “her family and I do”. Vows; if the couple say their own vows, give them space and step aside from the alter. You can stand next to the maid of honor or best man. This provides a more intimate moment for the couple, also allows for some photos of the ceremony without having you in all of the pictures. Bouquet hand off; sometimes the bride hands off the bouquet during the ceremony, help her remember to have it back in her hands after the kiss and before she leaves the alter. Processional; ask guests to stand in celebration right before the couple exits the aisle.